Injured Digimon have become its prey. It is an Ancient Beast Digimon which took in the metal elements of the earth, super-hardened its whole body, and evolved from one of the few Saber Leomon which have repeated and survived endless battles, where the weak are food for the strong. 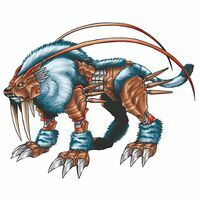 Its movements are not swift compared to Saber Leomon, but it possesses almost twice as much tough flesh and physical strength, and with its big, sharp, sword-like fangs, it forcibly brings down even Digimon larger than itself and which possess thick skin or armor. 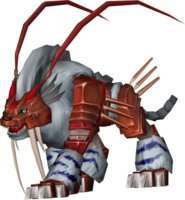 Other Digimon fear Dinotigermon, who possesses daring and wild predatory instinct, and do not approach. 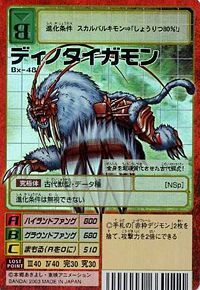 Its Special Moves are pinning down the enemy, then stabbing and tearing through them with its fangs (Ground Fang), and swinging down its fangs from an elevation, instantly cutting them to pieces (Highland Fang). 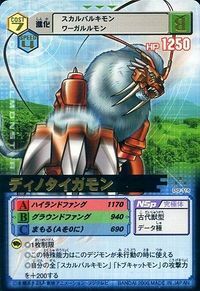 It took in the metal elements of the earth, super-hardened its whole body, and evolved from one of the very few Saber Leomon which have repeated and survived battles where the weak are food for the strong. Special Move: Pins down the enemy, then stabs and tears through them with its fangs (Ground Fang). Injured Digimon have become its prey. 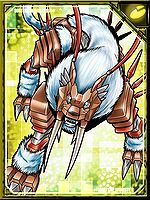 It is an Ancient Beast Digimon which took in the metal elements of the earth, super-hardened its whole body, and evolved from one of the few Saber Leomon which have repeated and survived endless battles, where the weak are food for the strong. 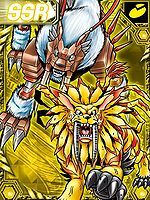 Its movements are not swift compared to Saber Leomon, but it possesses almost twice as much tough flesh and physical strength, and with its big, sharp, sword-like fangs, it forcibly brings down even Digimon larger than itself and which possess thick skin or armor. 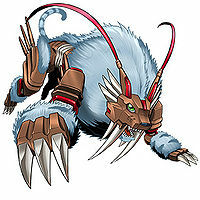 Other Digimon fear Dinotigermon, who possesses daring and wild predatory instinct, and do not approach. 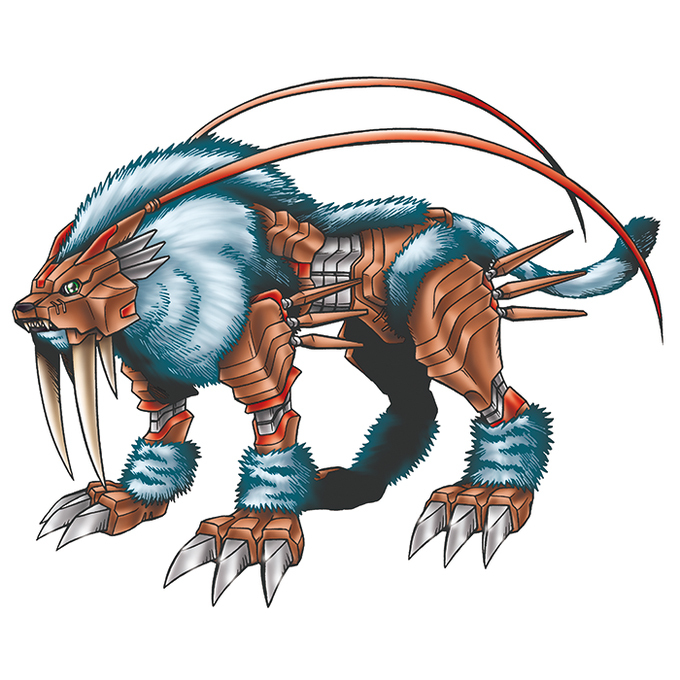 Dinotigermon's design is based on a robotic Smilodon, an extinct genus of machairodont felid. 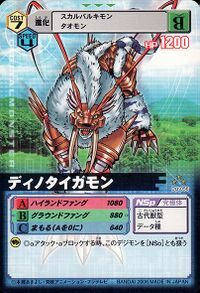 Highland Fang  ハイランドファング Hairando Fangu Swings its fangs downward from an elevation to cut through the enemy, or attacks multiple times with the claws on its forelegs. 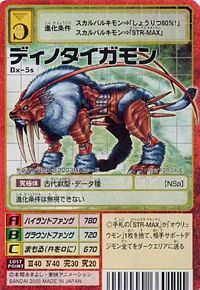 Ground Fang  グラウンドファング Guraundo Fangu Pins the enemy down and stabs and tears them with its fangs. 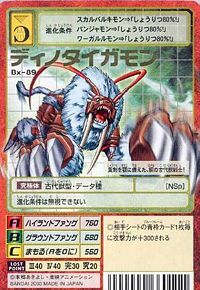 Can be evolved from Grappu Leomon. 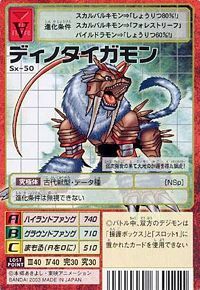 Dinotigermon is only obtainable as a collectible card. 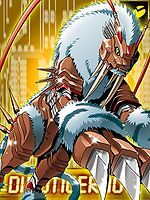 Dinotigermon is available as a Digimon Medal. Having received the protection of the land, this metallic tiger arises from the survival of the fittest! This ancient metal tiger's whole body was made super hard! This ancient beast warrior of steel is armed with bayonets on its jaws! This page was last modified on 21 March 2019, at 17:48.